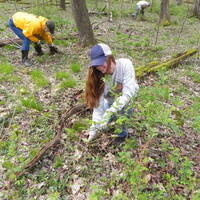 Celebrate Earth Day by helping to “weed out” invasive plants at Jennings Environmental Education Center. A tasty lunch will be provided at the end of the work session. Each volunteer also will receive a native plant to take home for their own garden or backyard. Participants must be age 12 or older and be prepared to work outdoors, rain or shine. Preregistration for the program is required no later than April 13th. Invasive plants are a major factor in the decline of native plant species, second only to habitat loss. Some non-native species are introduced intentionally for beneficial purposes, while others move as unknown stowaways and "hitchhikers," when people and their products are transported around the world. Over 1000 species of exotic plants have been identified as threats to native plants in the United States. Many grow and reproduce aggressively, and have few natural controls in their new environment. These invasive non-natives can severely alter habitats, disrupt ecological relationships, and diminish biodiversity.